We have our first feature-length post today, thanks to Milwaukee photographer and Cycle Source contributor Colleen Swartz—who provides not only the words, but also the image. Fritz Dietl started his adventure with Walt Siegl’s custom bikes with a Knucklehead that Walt built for him back in 2006. 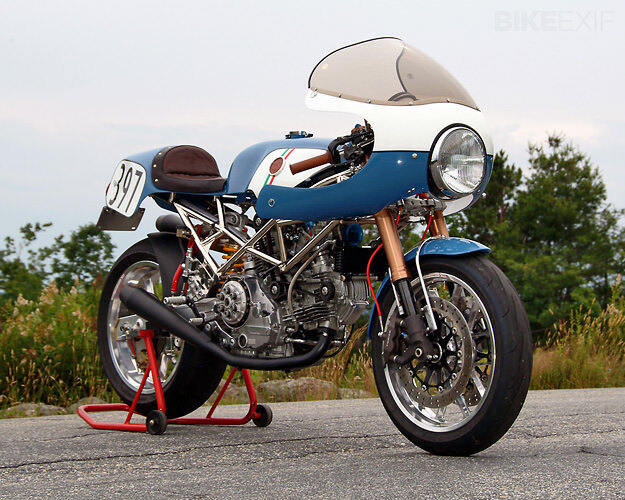 Impressed with the styling and performance of this build, Fritz came back to Walt in 2008—and asked for an air-cooled Ducati that would not only turn heads, but also be competitive on the race track. The project began with a heavily-modified and overbored Monster engine, breathing through twin 41mm flat slide racing carbs. Walt hand-fabricated the frame, hooking it up to a stock Monster steering neck and using the geometry measurements from his own 916 Ducati. Suzuki provided the GSXR forks and radial brakes, and the forged aluminum wheels are from Carrozzeria: they’re lighter than traditional magnesium racing wheels, and just as strong. Wishing to conjure the look and feel of late 60s/early 70s race bikes, Walt Siegl then applied original Maserati paints in French Blue and white. Classic colors from the Italian flag highlight Walt’s logo on the custom tank, embossed in brown leather. Burns provided the glass-packed reverse cone ends to Walt’s custom exhaust. The tank, which was designed to accommodate the battery and the coil in the fore-section, is hinged to provide easy access to the top of the engine. A GFTP faring was installed, with a custom fairing stay for increased rigidity. And Walt also created the fiberglass tail section upholstered with a Backdrop seat. The removable tail lamp is a CEV Italian original from the 70s. The details on this bike are all Walt: The front fender, the foot controls, the removable racing plate over the headlamp, the bars, the dash … you can see the attention to detail in all of them. Believe it or not, Fritz hasn’t cured his bug for Walt Siegl customs yet. He has placed another order, for another Ducati—this one to be fuel injected. Walt hopes to start Fritz’s third bike by the end of this winter, and have Fritz back on the track next season.